The array of recent strategies developed by the Parramatta Council City Strategy Unit has collaboration and design methodology at its core. Kati Westlake explains how strategic thinking has influenced the establishment of Sydney’s second city. The Parramatta Council City Strategy Unit has recently developed a number of strategies all of which involve design methodologies and collaboration, and demonstrate how effectively design-led approaches can inform strategic thinking about the city. These strategies include: Camellia; Auto Alley; the Green Web; the City Centre Planning Review; the 10 Big Ideas; the City Centre Lanes Strategy; the Parramatta City River Strategy and Design Parramatta. The most design focused of these was the Design Parramatta project, where the collaborative, design led approach generated many outcomes in addition to its original public domain framework purpose. Design methodology – analysing problems from several perspectives, generating a range of options, testing, prioritising and developing a preferred solution – provides excellent training for designers to contribute to developing both general strategies and design strategies. The presence of the urban design team in City Strategy strongly influenced the multi-disciplinary City Strategy teams to use design thinking and design skills in developing many of their successful strategies. Design Parramatta, used design methodology to generate the Parramatta City Centre Public Domain Framework Plan 2012 – a vision and spatial hierarchy for the upgrade of Parramatta City’s entire public domain network. The multi-designer approach developed consensus (amongst participating designers at least) as well as diversity in design response. Once created, along with other key Council strategies described above; Design Parramatta made its way into submissions to the State Government and the Department of Planning, pitching the importance of Parramatta’s development as a CBD for the whole of Sydney. This proposal was realised when the Metropolitan Strategy 2014 upgraded Parramatta from being a regional centre to Sydney’s second city. A key component of this was demonstrating that improving Parramatta was central to improving metropolitan Sydney. 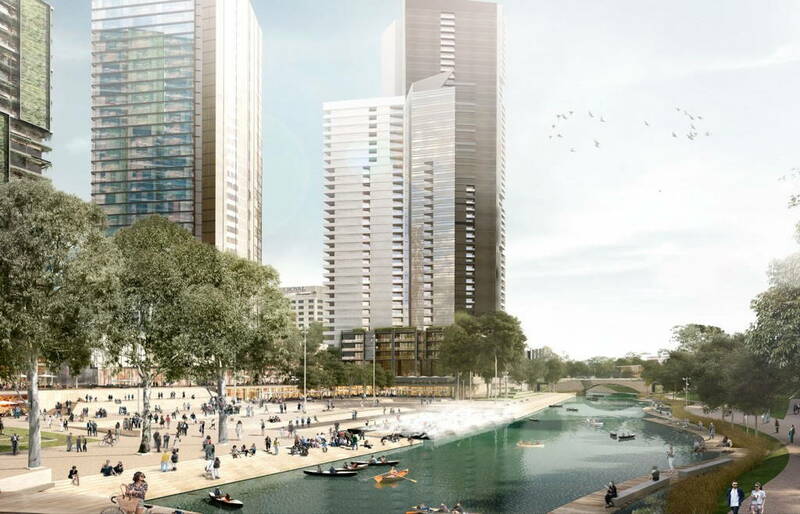 Parramatta City River Strategy, artist’s impression of River Square in Riverbank Redevelopment Project, by McGregor Coxall. 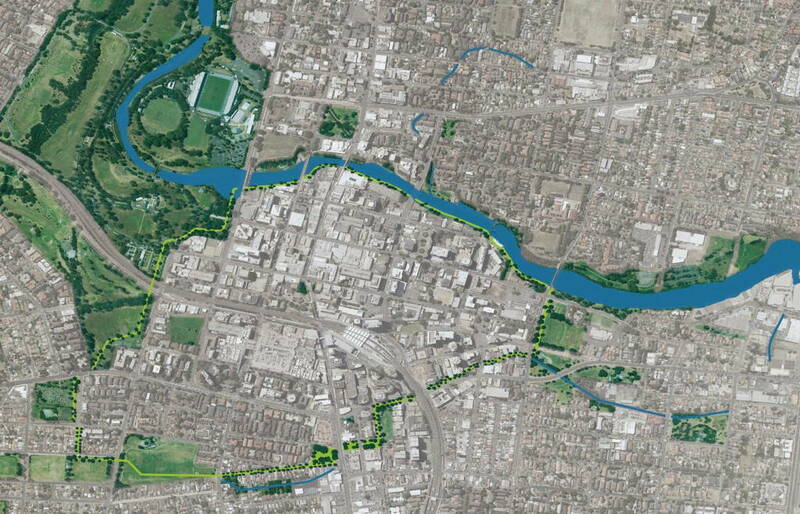 Concept for Green City Loop from Clay Cliff Parklands Project for Design Parramatta by GAO Landscape Architecture. Design Parramatta was also an incubator for the Green Grid Project in the Metropolitan Strategy. Helen Papathanasiou, (Manager Environmental Outcomes Parramatta Council) and I initiated this concept as the Environmental Big Idea in City Strategy’s suite of 10 Big Ideas for growing Parramatta. During Design Parramatta, the Government Architect’s Office (GAO) Landscape team led by Barbara Schaffer conceptualised a 4km long green parkland loop surrounding the city, as part of their Design Parramatta scheme. This made the GAO a clear choice as consultant team to develop Council’s Green Web (now Parra Ways) for Parramatta. With this project in hand, the GAO was able to successfully champion the idea for the whole of Sydney, and it now forms part of the Metropolitan Strategy as the Green Grid. Another Design Parramatta site, Church Street Mall, has now been transformed into Centenary Square, designed by JMD. Centenary Square has become the city’s busiest pedestrian and civic space. The program was to declutter, improve views and create sufficient flexibility for diverse programming – ranging from weekly markets to a 5,000 member audience such as the 2014 Paul Kelly concert – while still accommodating the city’s daily community. The square’s transformation reveals a new image for the city, supports better retail, encourages people to linger and creates a safer, more popular space. The Parramatta City River Strategy 2014 built on four Design Parramatta Projects, albeit within a wider foreshore context. This strategy was designed by McGregor Coxall and managed by Callantha Brigham from Parramatta City Council Urban Design Team, and has been adopted by Parramatta Council. The first built project to be realised will be an upgrade of the Parramatta Wharf with funding from Transport for NSW and the strategy will also inform many additional concurrent projects along the city foreshore including the Riverbank Development. Design Parramatta also influenced the city’s DCP, with the setback definition condition for George Street, (Australia’s oldest planned street still in existence) being strongly influenced by the Design Parramatta proposal for George Street project by Hill Thalis, JILA and Turpin Crawford. Design Parramatta brought many designers to Parramatta, and both the city and council benefited from this exposure – a kind of design bombing. Further, a prioritised funding and implementation plan for the city’s public domain is currently being prepared, and it is hoped that ongoing implementation of Design Parramatta projects will continue. In just three years the scale of proposed rebuilding for Parramatta City has increased dramatically and the projects will necessarily evolve to accommodate this. The inclusion of urban design within Parramatta’s City Strategy team allowed design thinking to inform many recent key strategies that have impacted on the city and metropolis. In particular, Design Parramatta, illustrates the wide range of important outcomes that may be generated by design strategy. In this instance they include: the illustration of a vision for the city’s public domain that is appropriate to its elevated status as second CBD; the incubation of additional further strategies; the further stimulation of built public domain projects and the generation of improved policy and planning guidelines. Along with more traditional urban design strategies such as the Parramatta City Centre Lanes Strategy and the Auto Alley Strategy, Design Parramatta has contributed to embedding design and design methodology into growing Parramatta City to ensure the city’s success and livability.